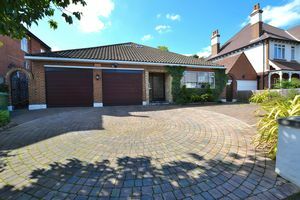 A unique opportunity to purchase this large 255.92m2 family home. We highly recommend an internal viewing to fully appreciate this generously-proportioned house offering expansive living and entertaining space. 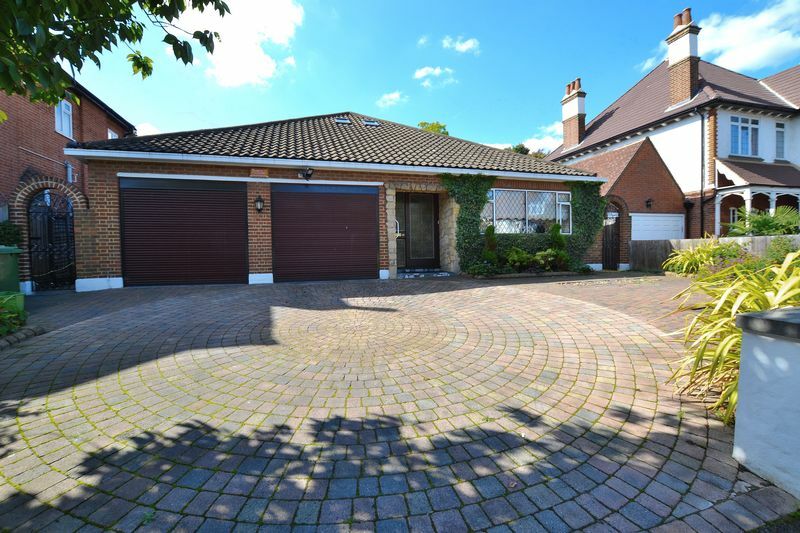 A wide landscaped driveway allows for up to 4 parked cars plus an integral double garage with remote-operated roller doors and fitted storage, the new gch boiler (2017) and solar thermal store. Door to inner hallway. 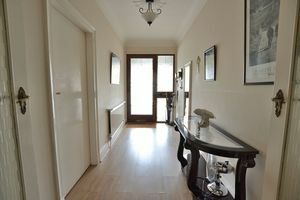 From the front door, stepping into the double-width outer hallway, on the right is the first of the king-sized bedrooms, fitted with built-in wardrobes, drawers and cupboards. Radiator, telephone and cable TV points. Double doors then lead to the large inner hallway where the next bedroom (current master bedroom) is located on the right hand-side. Also with built-in wardrobes, drawers and cupboards, radiator, telephone and cable TV points. 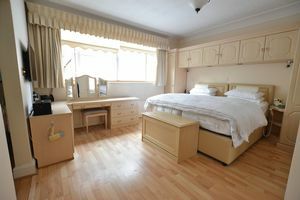 The master bedroom benefits from an en-suite shower room. 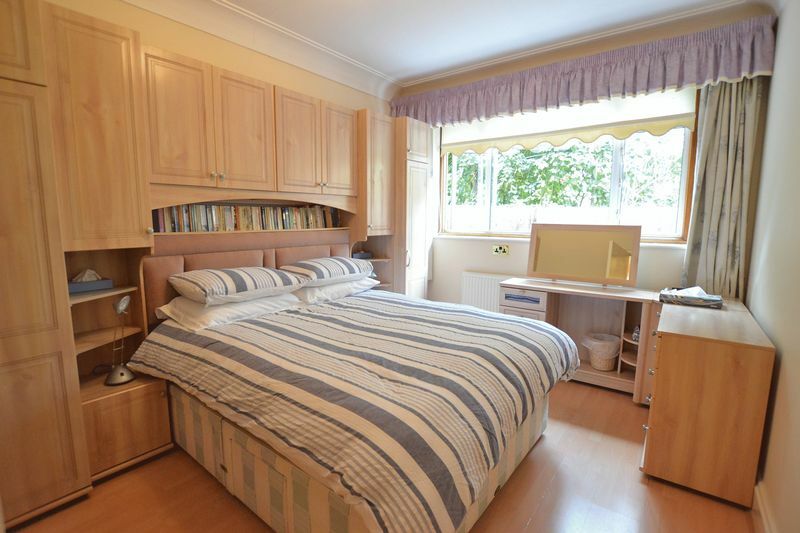 The next bedroom (adjacent to the master bedroom’s en-suite) is also located on the right hand-side of the inner hallway, with built-in wardrobes, drawers and cupboards, radiator etc. 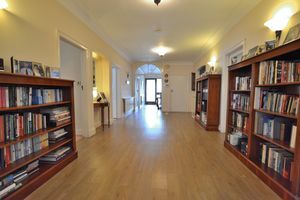 On the left of this spacious hallway, you enter the large family kitchen/breakfast room, equipped with country-style shaker units, currently accommodating a separate 8-seater dining table. Quooker boiler tap, filtered drinking water tap, washing machine, dishwasher, gas hob, double oven etc. Double sink plus an original Belfast sink which is adjacent to a kitchen door which opens onto the kitchen patio and rear garden. Adjacent to the kitchen, is another large reception room. 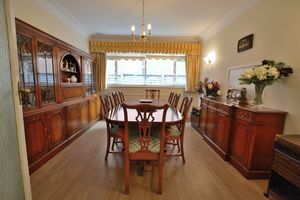 It is currently used as a formal dining room but could easily be used as a further large bedroom. 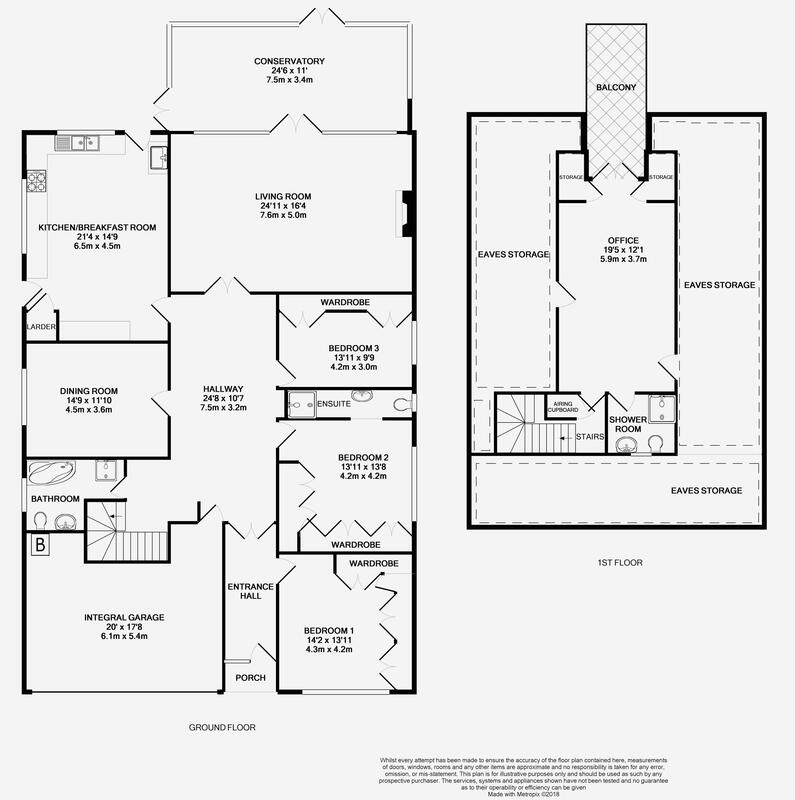 Also on this floor is the master family bathroom with jacuzzi bath, sink, w.c. and walk-in shower. 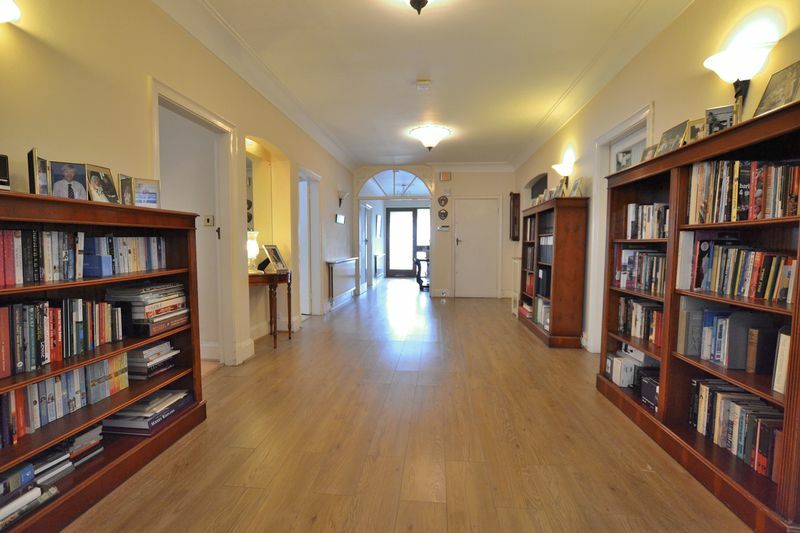 At the rear of the inner hallway, via double doors you enter a very large, bright and airy sitting room with a full-gas fireplace and mantel piece, wired for cable with telephone points etc and a ceiling-integrated home music system. At the rear of the sitting room are more double doors leading to the full-length conservatory with integral ac/heating. This is currently used as another dining space and and sun lounge. 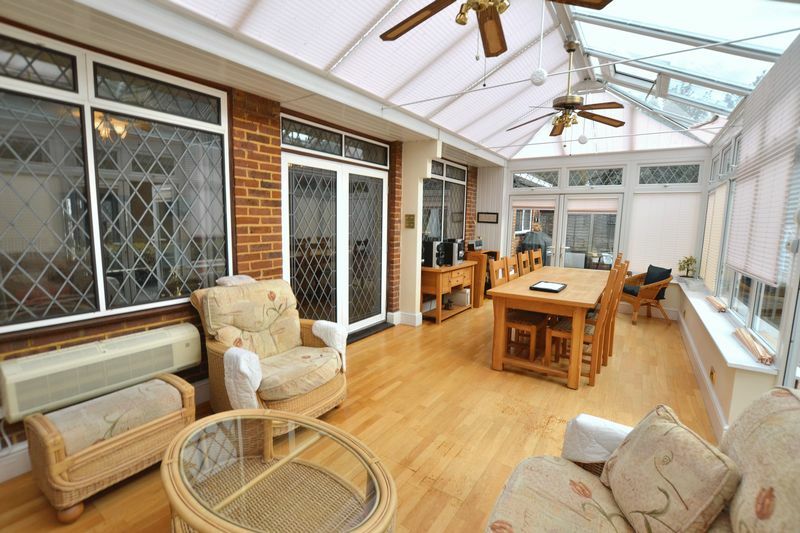 Further double doors open onto the much-favoured south-west facing rear garden. There are 2 sets of double doors - one onto the garden patio, the other onto the kitchen patio. Taking the stairs to the upper level, there is a linen cupboard on the landing and then you enter a large home office which has 7 velux rooflights. 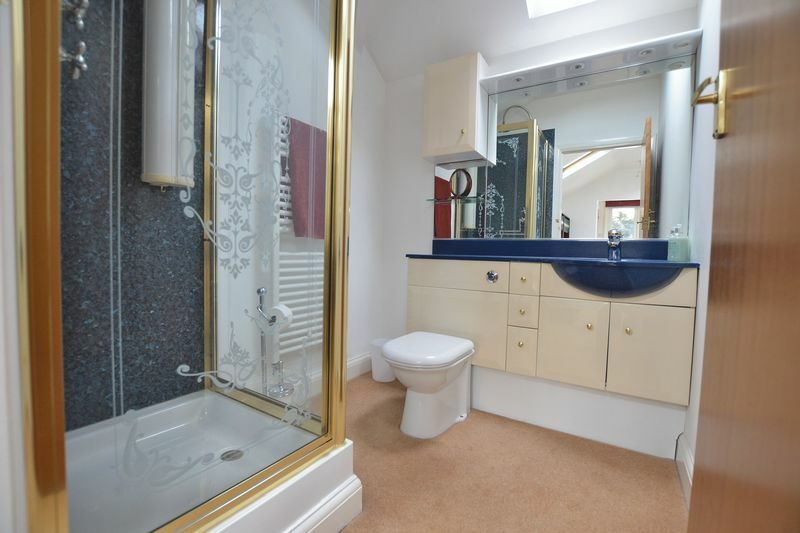 This room also has a full en-suite shower room. 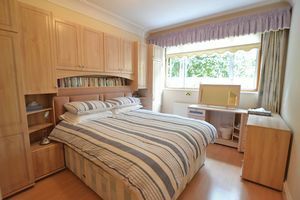 It would make an ideal master bedroom with its two large walk-in cupboards, easily-convertible into wardrobe space. 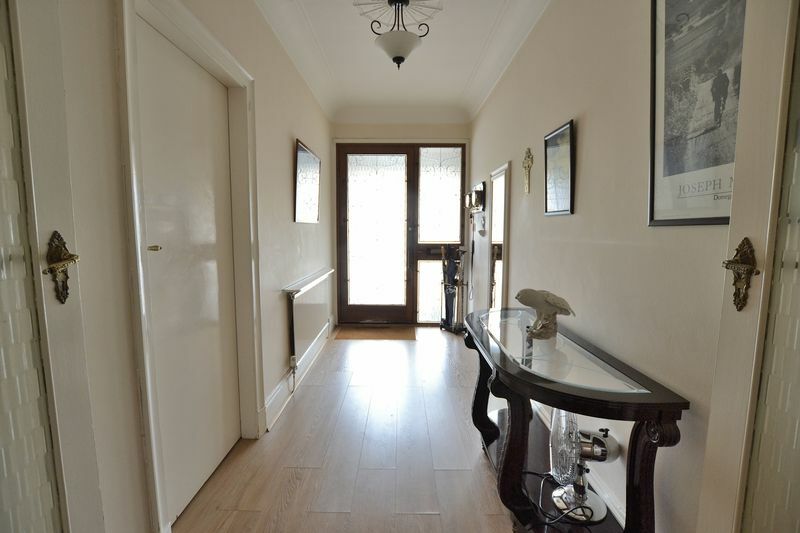 Two other doors either side lead into the eaves where there is an abundance of storage space completely surrounding this area and offering further conversion potential. 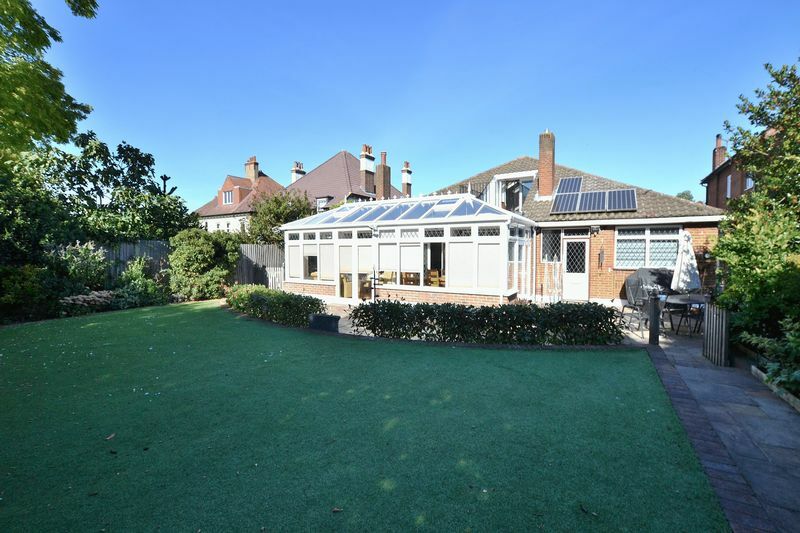 Double doors lead onto a private and secure south-west facing roof terrace with balcony, looking out over the rear garden and the neighbouring trees. 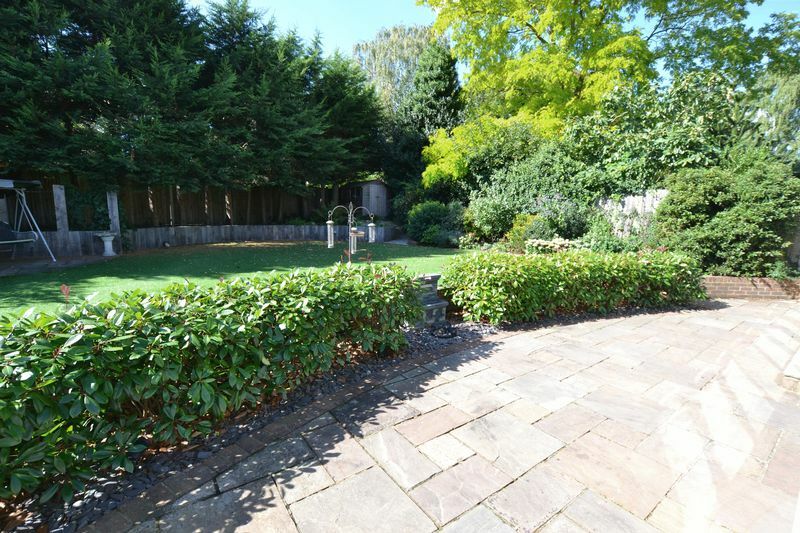 The rear garden is private, secluded and fully-landscaped by a Kew’ medal winner. It is easily maintained with mature shrubs, patios and paths and also laid with an artificial lawn. It includes concealed feature lighting with security sensor lighting is in place. Fitted with electricity-generating solar panels, the house benefits from the feed-in tariff, off-setting utility costs. There is a full security alarm system. 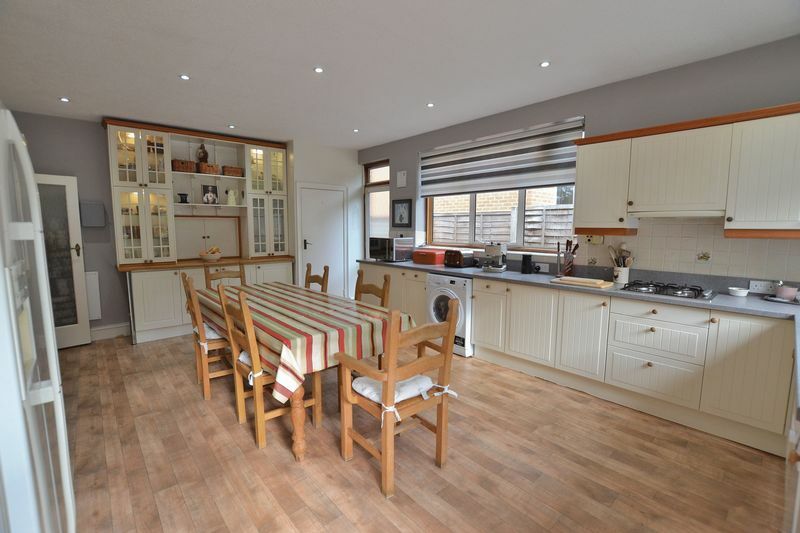 Superbly-positioned on quiet and leafy Kinnaird Avenue, close to Sundridge Park and Bromley Town Centre. Transport links are nearby as well as excellent-rated Ofsted primary and secondary schools. 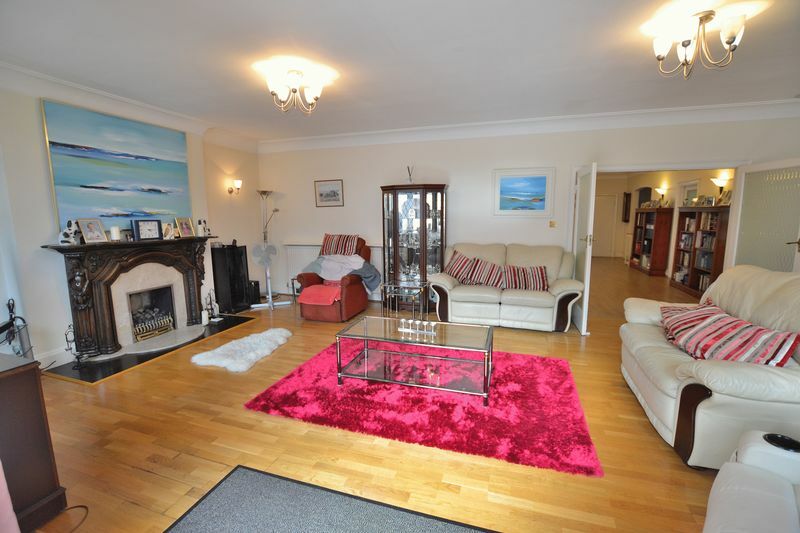 The property is offered chain-free. 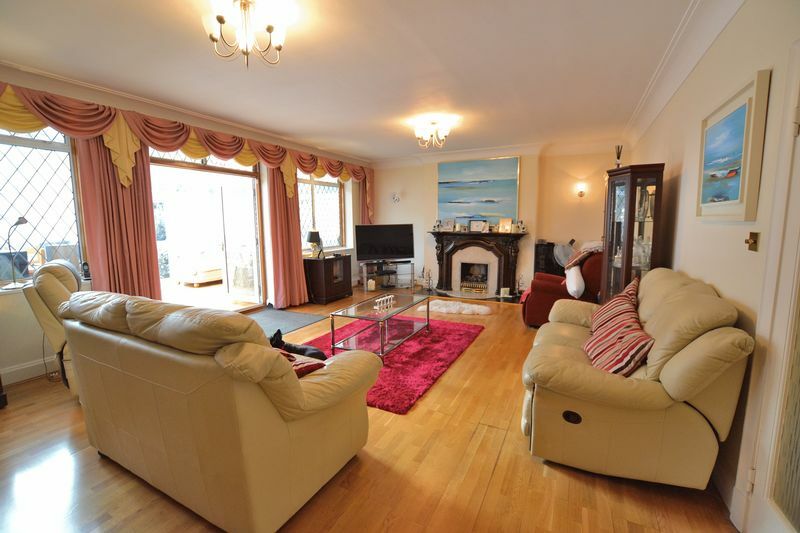 One single panel radiator, one double panelled radiator, laminate wood flooring and door to integral double garage. Double glazed window to front aspect views, double panelled radiator, laminate wood flooring, built in wardrobes, coving and power points. Double glazed window to side aspect views, single panel radiator, laminate wood flooring, built in wardrobes, coving and power points. Double glazed obscure window to side aspect, close coupled WC, vanity wash hand basin with hot and cold mixer tap, walk in shower with exposed valve, part tiled walls, chrome heated towel rail and laminate flooring. Double glazed window to side aspect views, double panelled radiator, laminate wood flooring, built in wardrobes, coving and power points. 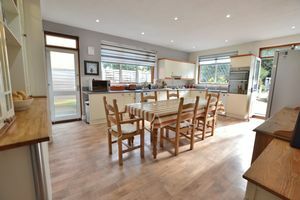 Double glazed window to rear aspect views, double glazed doors to Conservatory, feature fire place, three double panelled radiators, laminate wood flooring and power points. Double glazed windows to front and side aspect views, two sets of double glazed doors to rear garden and laminate wood flooring. Double glazed obscure window to side aspect, shower cubicle with exposed valve, corner Jacuzzi bath, close coupled WC, vanity sink wash hand basin with hot and cold mixer tap, tiled walls, chrome heated towel rail and laminate wood flooring. 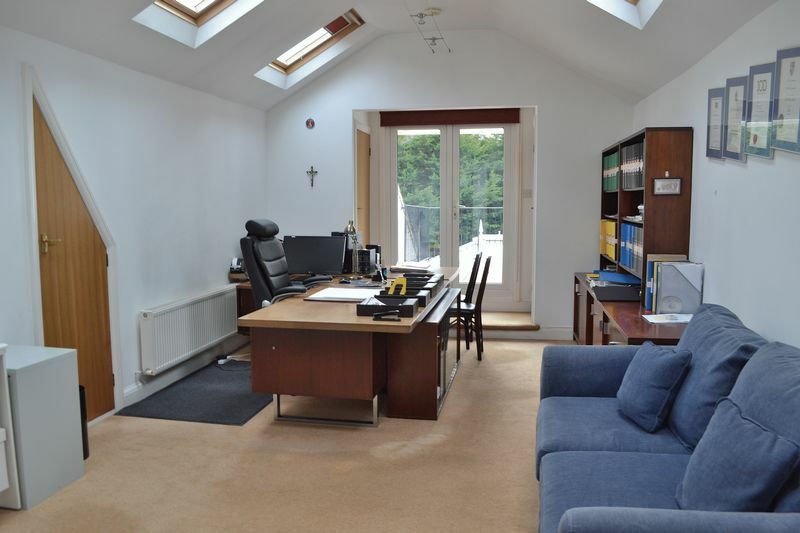 Double glazed window to side aspect views, single panel radiator, laminate wood flooring, coving and power points. 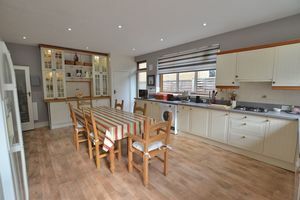 Double glazed doors to roof terrace, five Velux windows, double panelled radiator, power points, two walk in cupboards and two doors to eves storage. Velux window, shower cubicle with exposed valve and rain drop shower head, low level WC with concealed cistern, vanity wash hand basin with hot and cold mixer taps, heated towel rail and part tiled walls. 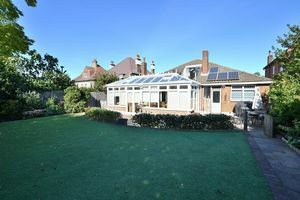 Well maintained mature garden with artificial lawn, shrubs and bushes and patio area with concealed lighting. Off street parking four cars.